Frequent travelers often browse through the site for reservation purpose. The challenge for client is to make their website the most preferred ones among frequent travelers. To measure and test the benefit of technology and user behavior they wanted to have analytics implemented. Keeping up with the behavior of the customers was an important aspect to be covered in analytics on the newly built multi-site environment. They also wanted to be clear on when and where certain events were to be raised. 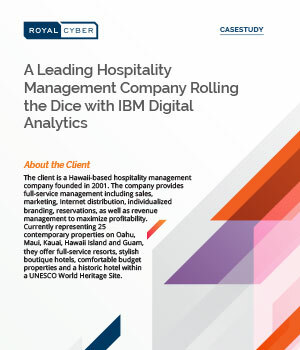 Royal Cyber Digital Analytics Implementation team helped the company by making applicable changes to their website and backend without modifying the website’s functionality to incorporate much needed new functionalities.